PROSPECT LEFFERTS GARDENS — The heated gentrification fights of this neighborhood have begun to turn inward, and much of the drama has centered on wild accusations against a local blogger Tim Thomas, who authors the Q at Parkside, by the folks behind two local groups that seem to have joined forces: Movement To Protect The People (MTOPP) led by Alicia Boyd, and Equality For Flatbush (E4F) led by Imani Henry. The two groups are aggressively anti-development and speak up for the folks living on the margins and at the edges – street vendors, undocumented immigrants, and against harassment of folks of color. They sometimes use disruptive tactics to get their points across. Community Board 9, which represents the area, at times has been completely paralyzed in its functioning as a result. They are obviously neighbors who care deeply about what is happening to their neighborhoods, not willing to sit idly by. Yet despite their best efforts, development of the area continues. The amount of development taking place from Crown Heights to Flatbush is staggering, and the community’s inability to have a meaningful conversation about it has been a disservice to all. There will be development in Brooklyn, whether we want it or not, and not just central Brooklyn. It is taking place all over. The city needs more housing. We need more well-paying jobs that enable people to stay in their neighborhoods. We need housing that is affordable so the seniors can age in place and young families can get started. The question is – who’s at the table, getting our voices heard, making sure that the community gets the best deal? Who’s keeping track? Tim Thomas is also neighbor, a white guy who has been documenting the goings on in his corner of the neighborhood for almost a decade. Take a look at his site, and it is obvious how much the guy cares about what is happening around Prospect Lefferts Gardens, how much he knows, and that anyone “who’s got it coming” was going to get their share from Tim. He goes after slumlords and developers alike, documenting life in the neighborhood as it is on any given day — the good and the bad, and tackling neighborhood issues head-on and vocally. He’s got a big mouth. That he did not spare MTOPP or it’s leader, Alicia Boyd, is not surprising — he does not spare anyone. A lot of what this boils down to is change. We dove into the underlying issues, which do not seem to have changed much, back in 2016, looking at how the development pressures are boiling over in the neighborhood, and how a Community Board that cannot discuss them in a meaningful way was not in the best interests of the community. It is not to say they did not try. And MTOPP and Boyd weren’t the only ones called out; Thomas was removed from the Transportation committee of CB9 for his “combative personality”. The conflict between MTOPP and Q at Parkside has escalated recently, with MTOPP and E4F announcing their plans to protest against “gentrification and white supremacy,” with a rally on November 3. Titled “Racists Out Now!”, it uses a poster that puts Tim Thomas right next to Theresa Klein (of the “Cornerstore Caroline” incident), and Gavin McInnes of the Proud Boys, calling him a “Racist & Sexist blogger at The Q at Parkside”. Lumping all the “Flatbush gentrifiers” in with Theresa Klein of the awful and inexcusable “Cornerstore Caroline” incident is on par with lumping all the white people in Brooklyn in with Gavin McInnes, an actual violent white supremacist. It is simply not true. And the only statement made about Tim Thomas here that is true is that he is a blogger at Q at Parkside. What I hear is desperation, though. Development is accelerating, displacement is happening, and it is affecting those on the margins of our society first and hardest, and changing the fabric of our communities at an ever-increasing rate. Community activists on the ground bear witness to it on daily basis. But here’s the deal. In order to have an impact, we need all the voices that care about the community to be able to speak up without fear of retaliation or harassment, or fear of being called racist, sexist, gentrifier, nut, or plain old crazy, and least of all fear of having your livelihood taken away. We need to be able to talk like grownups about the hurt, the injustice, the pain that accelerating change keeps inflicting. We need to be able to acknowledge that and think thoughtfully, creatively and quickly about how we can come up with solutions that help, before, as E4F likes to say “it’s gone,” before our communities of neighbors have disappeared, dissolved, been displaced. We need to be able to talk, and we need to be able to listen, respectfully. Tim Thomas has been keeping a public record of what’s going on, and it takes a lot of work to figure out what’s really going on. He does not claim to be a reporter, he does the best he can, with the time he has. He has done that expecting nothing in return and taking a lot of heat over the years. He’s apologized when he’s made mistakes and crossed lines, something few these days are willing to do. And he’s also continued to inform his neighbors about the daily life of their neighborhood. This community needs him. Every community needs a Tim Thomas. The folks at MTOPP and E4F are also trying to uncover what’s going on, and speaking their truths, and standing up for people. It is important that their voices are heard, too. They are also taking quite a bit of heat. In the end, their goals are not all that different from Tim’s – trying to keep their neighborhood a neighborhood, a place where diverse people can find a welcoming home. The city does not care about where a big new building or a new homeless shelter will go up, we do, in the neighborhood. We care about the neighbors having to depend on a food pantry, we care about horrid housing situations and slumlords, we care about neighborhood kids not getting a good education, we care. We show up. We talk. And we need to all be able to talk – on street corners, in Facebook groups, in blogs, concerned residents and reporters alike. This latest exchange between the parties, however, seems to have brought the worst of the overall deterioration of political discourse in America to this Brooklyn community. We need to get past the point of calling everyone we disagree with names and trying to shut them out of the conversation — suggesting they move to wherever they came from though they grew up right next door — if we are ever going to sit down and talk to each other again, to paraphrase a question Tim Thomas posed two years ago. I hope we can, because our communities and our neighbors need us to be bigger than that, and they need it now. It’s a growing trend on the political Left to try to silence opposing voices and viewpoints. With Imani Henry and others of his ilk going after Tim Thomas, we see those chickens coming home to roost. I’m stunned, but immensely pleased, by this editorial. It’s not at all what I’d have expected from this site, but it is exactly what we need. We have to stop behaving like toddlers and listen to people we disagree with. It really is that simple. Gavin McInnes is not a white supremacist. Now is a more important time than ever to push aside race politics and acknowledge that we have more in common with those of the same socioeconomic status than someone who is the same race but of a different socioeconomic status. Separatism is dangerous and exactly what the elite want among the disenfranchised and poor. 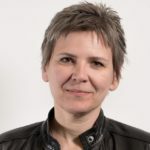 What about Alicia Boyd’s and MTOPP’s smear campaign (and lawsuits!) against PLGNA, a neighborhood organization founded 50 years ago (well before she came there) and her and MTOPP’s collusion with IDC senator Jesse Hamilton (via a spurious organization known as Woke Brooklyn) to attack Assemblywoman Diana Richardson for her support of challenger (and victor in the September primary) Zellnor Myrie? These are not the actions of someone who cares about this area, quite the opposite. When I was on sites like this 3 or so years ago ranting about the dangers of transplant provocateur Imani Henry, I was often ill received. It’s so obvious this man is stirring up controversy that doesn’t exist. And their has been this unreal push to link Flatbush to other black neighborhoods. Too bad it took so long for everyone else to catch up. The pairing of Flatbush and Crown Heights is laughable, these aren’t congruent or adjacent neighborhoods. Henry’s and these other folks program amounts to a new arrival tax. You come and are told that you’re a bad gentrifier and in turn you can repent by funding Henry and friends crusade. The West Indian blacks that are the alleged subjects of this gentrification aren’t victims. Look as the statements taken in the community after the Cornestore Caroline incident. Furthermore, those folks are paying the same rents that Caroline is. Flatbush doesn’t have any NYCHA facilities or many rent controlled units. The mother in the corner store incident is a lieutenant in corrections – not exactly a working class salary regardless of how you feel about the occupation’s prestige. The black renters in Flatbush are middle class and generally paying market rate. A very different sort of neighborhood from Crown Heights as a whole. This neighborhood has done well as a mixed neighborhood which it’s been since about since the late 80’s. It’s not historically black. And has never reached a black super majority. Just as it was considered a well to do neighborhood for the white ethnics that dominated for the 80 years prior – blacks held Flatbush in a higher regard than its surrounding neighborhoods. I know this because I’m black and lived in Flatbush for all my life save for my time at college. Beyond that their argument in regards to the historical nature of the buildings in PLG is laughable. It exposes the very fraud if you care to dig deeper. Simply put, 6 story construction can’t be the nature of plg and the prospect park surroundings when we have so many examples of the actual single family constructions that covered the whole of the area. The big buildings only came in the 10’s and 20’s whereas the brownstones and woodframe victorians date back from 1840 – 1900. Yet they argue that six story tenements are constructions that represent the historical development that took place in post antebellum Brooklyn. Even using modern descriptions of these places exposes the fraud. PLG is known as the neighborhood that sports brown and brickstones with garden plots in front and tree lined avenue – not as a haven for 6 story buildings. As for the the new construction, some of these older buildings are over taxed and while building bigger might imply that we’d have more new neighbors in many cases the newer buildings would house less people as singles and couple condo owners would likely replace more mature families that rent. Either way neither construction is in line with the original context of the area. So the arguments of overcrowding and context falls on its face. 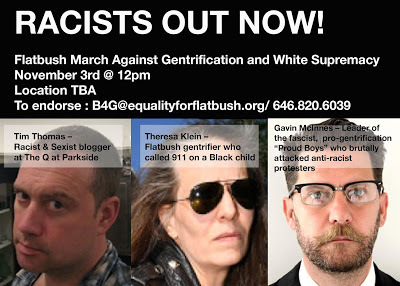 The Equality 4 Flatbush Facebook page is enlightening – when people ask (and several have) why Tim Thomas is included as a racist, the response is basically “he’s racist because we say he’s racist.” Also that we should do our own research and talk to (unnamed) community members who think he’s a racist. Huh? Equality4Flatbush calls him a racist and we’re supposed to figure out why? Seems like producing evidence is their responsibility. Or it should be. This Thomas guy’s blog, if you search through it, has pages and pages and pages of extended posts attacking Boyd extending back for years. Right up until today. Couple that with the real fact of his having been kicked off of a community board for “inappropriate behavior,” and this just gets downright creepy. No doubt he and Boyd have serious differences. But somehow (unlike his defenders on his blog and elsewhere–his posts attacking Boyd seem to be far and away his most popular amongst his commentators) it’s just seems beyond credulity to acquiesce to a claim of some kind of equivalency to the sides in this dispute (much less to jump on the popular “blogger being denied his 1st Amendment rights [sic] and being the sad victim of slander [sic, again] or some sort of “reverse racism.” The optics as seen from over here, that of a senior Jewish guy birthed here over 6 decades ago, is one which seems to show a white man (with all the inherent “privileges” as such, as the kids like to point to these days) who has at minimum, a seriously unhealthy, disturbing obsession with a Black woman who seems offend a certain segment of our world by virtue of being louder, more aggressive, more uncompromising, then the gentry and wannabe gentry around here think they have some inherent right to not have to deal with. Sorry, but for some of us, this just reeks of the modern day complaints and attitudes of my youth–which one of “them” are “the good ones” and which are “the bad ones.” This is sinister–it was when they did it to civil rights activists who dared use civil disobedience [troublemakers!!!] and it is sinister now when used against activists like Boyd, who dare disrupt the sanctity of corrupt institutions that exist mainly to sell out their neighbors for their own gain. You can demonize her all you want. This old white guy has got her back. I trust her far more than many of these wolves in sheep’s clothing out here. Always will. Hey, at least he’s well sourced. I wonder if Michael Klein was on Alicia Boyd’s mail list and happened to see any one of the extended emails she sent flat out lying about Thomas and the CB9 saga, among other locals. I see Michael didn’t bother to elaborate on why Thomas wasted even a single iota of space on his blog to address Boyd to begin with, probably since he’d rather someone glancing at his comment believe that Thomas was just some haughty white dude with an ax to grind against a “local activist” who may or may not be engaged in illegal business activities by her own admission in relation to a non-profit organization and Michael’s white enough to call it when he sees it? I dunno, seems off Mike. Not fooled here employs typical Trump-like, Fox News, post-truth logic–hurl accusations without a shred of evidence, and pretend it is a fact. Sad!! Come on Alicia…er, Michael, it certainly wouldn’t be the first time a sock puppet has appeared on a blog. Surely you must remember that from your days on Brownstoner, when you’d talk (under a variety of pseudonyms) about how dangerous PLG was in order to scare away gentrifiers and developers. Still, we all knew it was you! Eliza L, 5 Year CB9 Resident, and Not Fooled, Y’all are embarrassing. I did a simple search on Michael Klein and found that he is a real white fella in his 60’s and is apparently much more astute then all your privileged butts. There’s a Gothamist article about that Tim Thomas style white, “liberal”, racist, Becca Brennan from 2017. Michael Klein is quoted in that article and it gives his age at the time as 60. He had some profound words to say regarding Thomas’ counterpart, Brennan. I’m glad people like Alicia Boyd exist in order to expose what racists you really all are. To me she’s in the tradition of Philadelphia’s MOVE, Assata and the BLA, Fred Hampton and the Panthers. She’s loud, uncompromising, and much smarter than all of you with your Corporate Democratic Party hit pieces in rags like Politico that say absolutely nothing. And that Politico electioneering no proof accusation piece that Tim Thomas likes to spread as fact is very much along the lines of COINTELPRO. It’s designed to discredit but if you actually have some capacity for reading comprehension, it says nothing. I’m glad this is happening because it exposes the complete and utter lack of logical arguments that the anti-gentrification (see: anti-white, anti-business, anti-success) contingent has to muster. So far, people like Klein and Boyd have one claim: Tim is a racist. Why? “Look it up yourself.” “Google is free” “Talk to the community” Tim, on the other hand, has hundreds of examples of Boyd disrupting, derailing, and filibustering against her true enemy: discussion itself. She and Imani are completely dedicated to shutting down any discussion. All of their actions point to this clearly. The issues at hand, housing, development, zoning, community, all of it is off-limits to them. Their only goal is to gain control and power, and sadly people like Klein and others are first in line to get “good boy points” by supporting them. Fortunately for sane people, all they’re really doing is showing their true colors. In the end, the truth always wins. Wow BJ, and did your simple search show that this white fella in his 60s was the one who actually posted to this blog as Michael Klein? Wait, you mean some troll could come here posting under an actual person’s name? Surely no one on the internet would ever entertain such an idea! Nice try, though. I think you’ve gotten a little rusty since the days when you trolled Brownstoner and spent all your time badmouthing PLG and Crown Heights. Having lived into my 60s, I have noticed that the most common (and idiotic) troll behavior is to avoid discussion by calling someone you dont like and wish to silence a “troll.” Personally, I coild give a marsupial’s tukhis whether you think Im an old white Jew, Alicia Boyd, or the Queen of England. I am me. And will continue to be. Now the guy who is obsessively stalking Alicia Boyd, and who has a history of being so disruptive and shady that he managed to get hisself booted off of a community board (no mean feat), well, that’s NOT ME. Sorry Mikey. No cigar for you.